If I’ve heard it once, I’ve heard it a thousand times….you can’t grow fruit trees organically. I beg to differ. 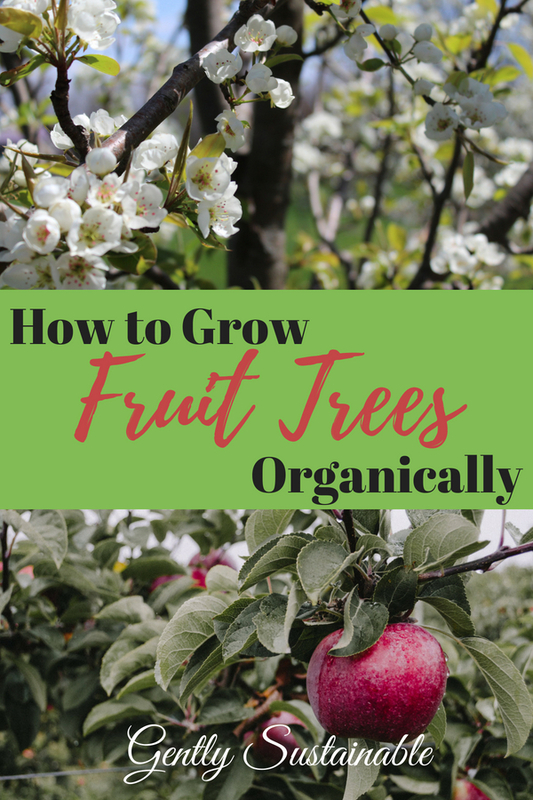 While it’s not a perfect system, because there isn’t one, my simple 3-step plan will explain and demonstrate how to successfully grow fruit tree organically! 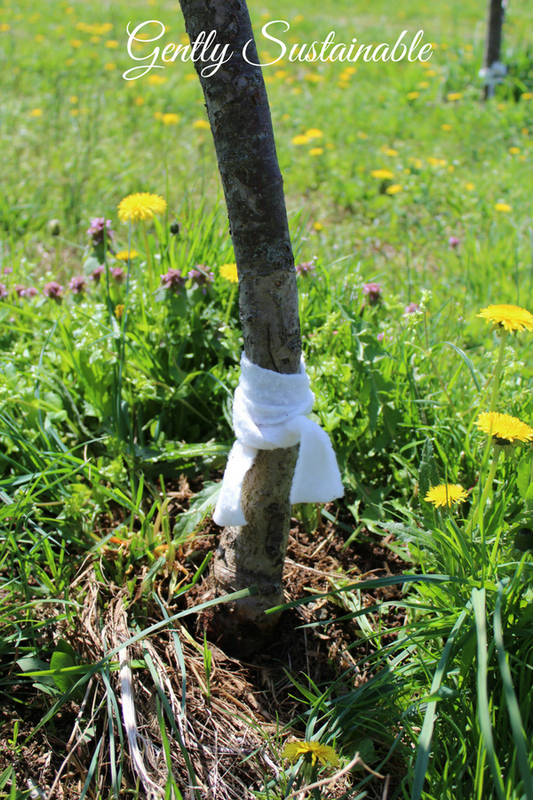 Fruit trees can be particularly difficult to grow without chemicals, especially in a state like Ohio, where the moisture and humidity can lead to a host of problems…moisture in the soil will attract all kinds of pests that would love to eat your fruit! We also deal with fungus on the leaves, but don’t worry, we’ve got some answers for you! But with just a few simple steps, you can outsmart the pests and disease! First, I deal with bugs and ants that crawl up the tree from the ground. I would guess that these bugs account for about 50% of my pest issue. This is dealt with easily. Using some sort of batting, (here I’m using some scrap quilt batting), cut enough 3-4″ strips for each of your trees. 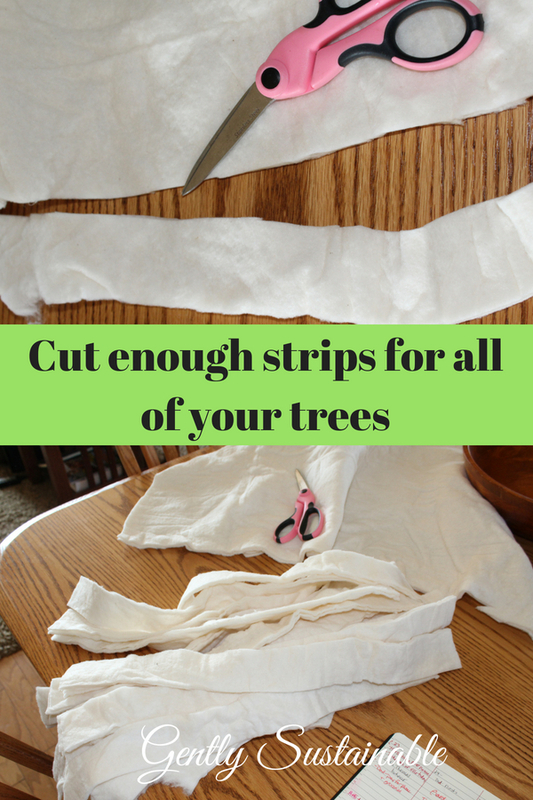 Simply wrap and tie these strips to the bottom of your tree trunk. Boom! You have just eliminated all crawling bugs from reaching the top of your tree, where the fruit is! Their legs will get stuck in the batting and they will die. For some added insurance, you can sprinkle some diatomaceous earth around the base of your trees as well! For larger trees or other areas that you want to keep bugs at bay, there’s a product called “Tanglefoot“, which is a tree insect barrier kit that I can recommend, it’s pretty cool. Be SURE to keep the area around your fruit trees trimmed, otherwise you are just providing a “bridge” for insects to climb. I use this little cordless hand trimmer and I totally LOVE it! The second step is to mix up a non-toxic spray to use on your fruit and leaves. The theory of using a natural spray for your trees is not to kill pests, but to deter them. Neem oil has been around for a long time, and works very well to keep bugs at bay. Bugs HATE it. Neem oil, used as a pesticide, is said to control over 200 species of insect and over 15 types of fungus! The bummer part about being organic is that you will need to re-apply every time it rains. But that’s a small price to pay for organic fruit!! I use a large pump sprayer for this, but not to big to carry around with you as you spray. You will also need a gentle soap to help the neem oil cling to the leaves. Spray the fruit and leaves well, especially the underside of leaves. Don’t forget to spray the trunk. Don’t soak it down, but make sure everything gets sprayed and has time to dry. I start this spray soon after the petals fall off the blooms. Add to your sprayer and you’re all set to go. Feel free to adjust this amount of neem in the recipe if pests are persistent. The third step is to control birds from eating your fruit. Birds around here just LOVE my cherry tree, but I keep them away with bird netting! It takes care of the problem almost immediately! So, there’s your 3-step program to grow organic fruit in your own backyard! Control crawling bugs with batting at the base of your trunk and diatomaceous earth. Use neem oil recipe to spray the fruit and leaves. The batting is a GREAT idea!!! Any ideas on how to prevent moss growth? I live in Oregon and here, on my 5 acres, moss immediately grows and takes over all my trees!!! Hi Carol! Let me answer your questions one at a time. I put the netting on just as soon as the flowers fall off. As far as how long I keep it on, it depends on if I can GET it off! I have a cherry tree that will not let go of the netting and so I leave it. IF you can get it off (and it certainly won’t hurt to leave it on) then you can certainly use again. I would not attempt to cover large trees with the netting, that’s just too big of a job and would require a lot of netting. Rather, I would consider other ways to freak the birds out, like hanging pie pans in the tree. You would be surprised at what scares birds away to someone else’s fruit tree. About moss, I’ve included a few links here for overall prevention and organic treatment. I don’t deal with moss here in Ohio, but here’s what I came up with for you here, here and here. Thank you so much for commenting and good luck! What do you do about squirrels? Or do you think its the birds that get all the apples off of the tree before the harvest? It seems like we never have many apples they are all on the ground right when they start. It’s hard to say who’s eating/destroying your fruit, but I know that neem oil helps with squirrels. Here’s a link with a few more ideas. I’ve also read that putting some kind of aluminum casing around the trucks and lubricating with cooking oil keeps them at bay, but I’ve never tried it. Simple things like the netting and maybe hanging tin pie pans might help. Maybe install a squirrel feeder nearby so that they’ll eat that? Also, putting out some water in old pans will help as many critters eat fruit and veggies because they are thirsty. As for dealing with nature and it’s critters, I try to just “share” and accept a certain amount of loss, otherwise I would go crazy.